This bizarre team-up began, like most good things do, on Smash Mouth’s tacky-but-savvy Twitter account, a vessel for nostalgia, beefs, and continued relevance through Shrek memes. Sometime in 2016, whoever mans the Mouth account declared Car Seat Headrest’s “Drunk Drivers/Killer Whales” one of “the best songs of 2016 point blank.” Then, a few months later, some random Twitter user suggested that they make a split EP together, and both parties agreed to do it. Who knows if that’ll happen, but we now have two earnestly good covers out of it, so anything is possible. Smash Mouth currently exists in two worlds that often collide: they’re both an untouchable meme, and a band that sometimes plays free and open-to-the-public outdoor concerts. (I saw one of these last year, where dozens of people in attendance dressed up as Shrek, surrounded by police horses. 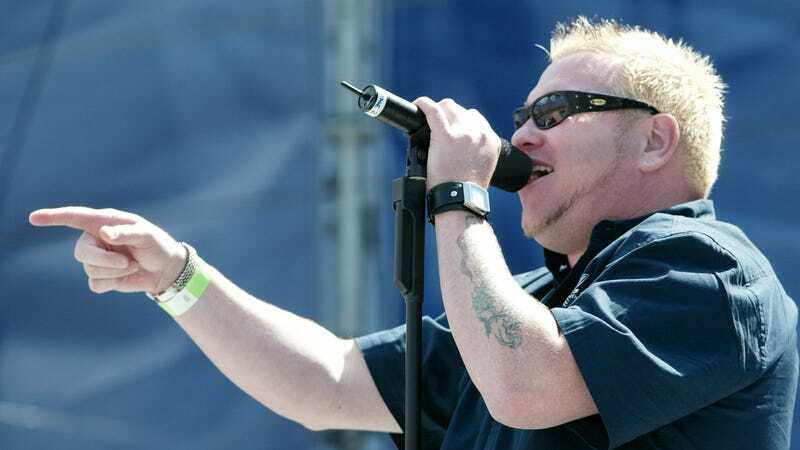 A friend aptly called it “white chaos.”) You’d be fighting an uphill battle to argue that frontman Steve Harwell and the gang are in their prime. And yet, they continue to enter contemporary cultural conversation because of an interest in hyping younger bands on Twitter. This is all so strange, and so much better than it has any right to be—we can only hope it leads to more insane collaborations down the line.